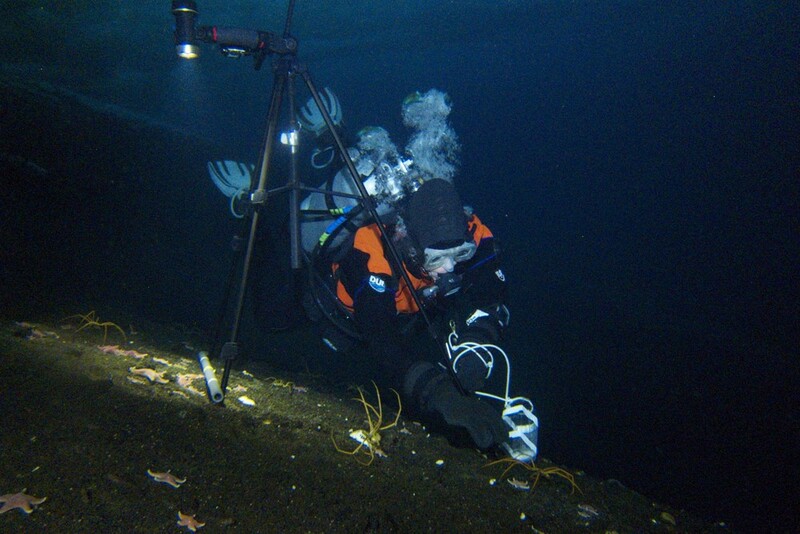 Diving in Antarctica is cool--really cold in fact! 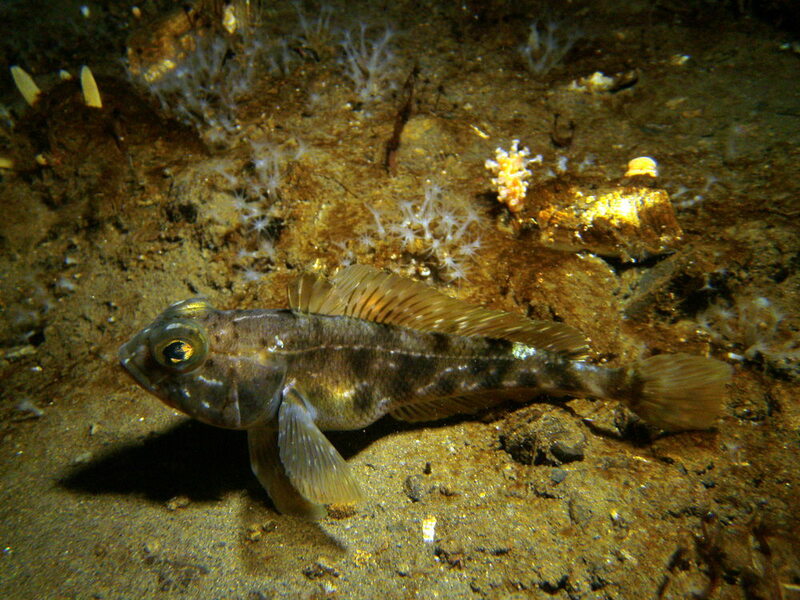 Here's a gallery of descriptions and pictures of our science diving. 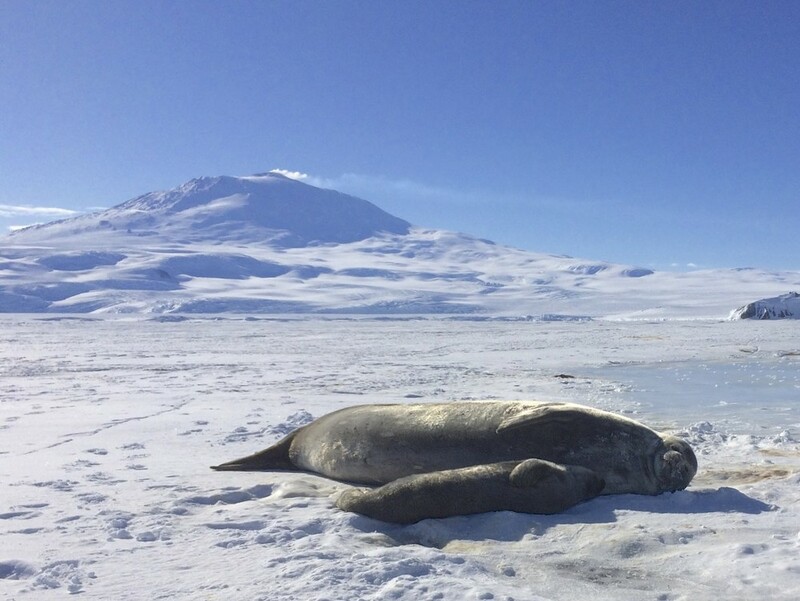 Our dive sites: We've made dives at remote sites including New Harbor (a field camp about 50 miles from McMurdo Station), Granite Harbor (see below) and many spots within driving distance of McMurdo Station. We drive to local spots in a pisten bully - a modified ski slope grooming vehicle - and the holes are (usually) covered with a heated dive hut. Check out some pictures from these sites! Amy hands Steve a camera at a safety stop at Dayton's Wall. Art and Bret going back to the dive hole at Dayton's Wall. Steve and Bret transfer survival bags from one pisten bully to another out on the ice. Dive hut being towed over the dive hole. Two pisten bully on the ice with the drill rig in the background. Steve Rupp in the pressure ridges at Turtle Rock. Amy at Turtle Rock herding spiders to set up a timelapse - we want to know how fast big sea spiders move and how they coordinate their movements. Divers near the ice wall at New Harbor. Caitlin in the helo headed to New Harbor. McMurdo Station viewed from the helo as we flew out to New Harbor. A mom and baby seal at Turtle Rock. Steve and Amy hunting for sea spiders at Arrival Heights. Oxygen, pressure, temperature, and salinity dataloggers that we put out at the McMurdo intake jetty for year. We'll collect them next October! View from the helo as we approach the Granite Harbor site. A rainbow of drysuits in the McMurdo dive locker. November 16: We recently flew in a helicopter to Granite Harbor (a bay about 80 miles northwest of McMurdo Station). Because it is difficult to get a drill out to the site, we found a nice seal hole that we expanded with an ice pick and saw. 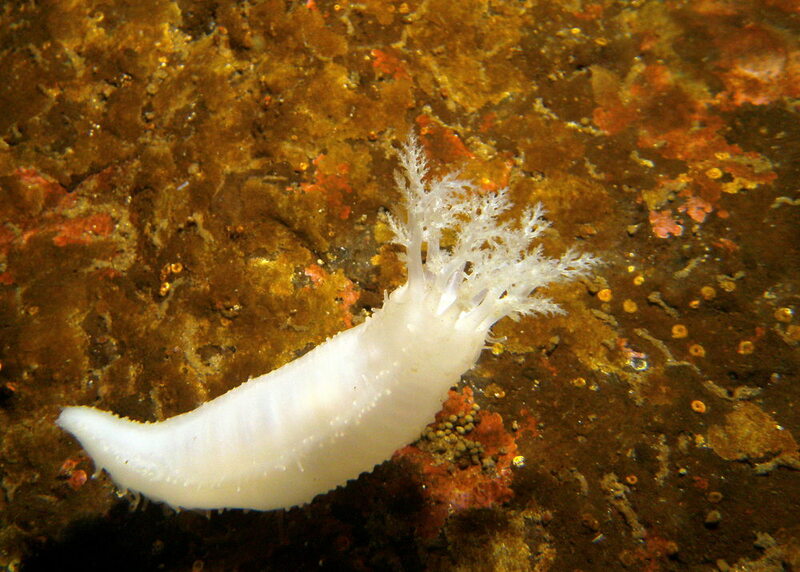 Here are some pictures from our dives! Amy and Steve expanding a seal breathing hole so we could use it as a dive entry point. October 22-27: Images from our latest SCUBA dives. 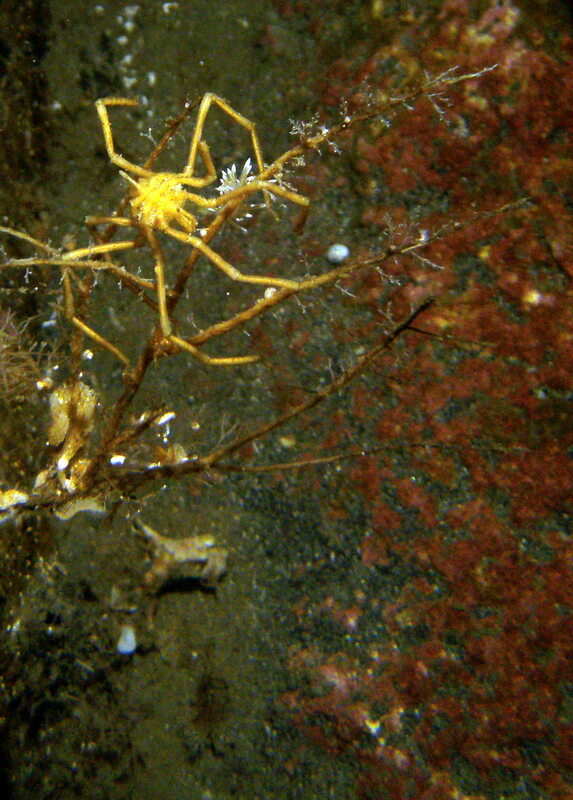 During these dives we saw several male sea spiders carrying eggs and even collected a few 10 legged sea spiders! Sea spider (Colossendeis) feeding on a piece of jellyfish. The jellyfish is also being devoured by an anemone. Sea spider Pentanymphon antarcticum. This species has 10 legs (although this individual has lost a few)! 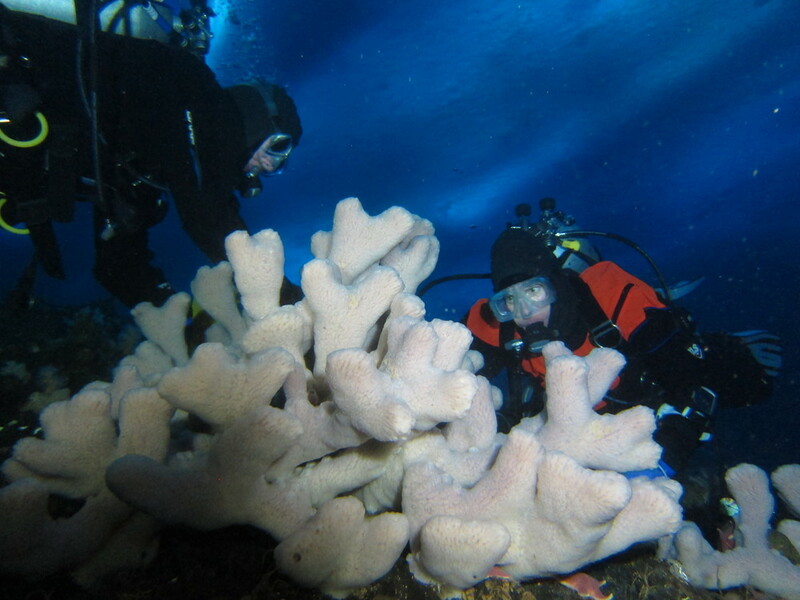 October 12-14: Check out these pictures from our first few dives in Antarctica! Dive hole from under the ice. The ice around McMurdo Station is approximately 6 ft thick and must be drilled through with a giant ice auger. We placed data monitors out to measure the temperature, oxygen, salinity, and pressure of the water. Art Woods giving the "OK" sign after setting up the data loggers. During the year before deployment, several of us got certified to ice dive by PADI. Ice diving was a new experience for Steve and Bret, and a refresher for Art. We dove during the winter at Lake McDonald in Glacier National Park and at Lake McGregor, a bit west of Kalispell, Montana. We worked under the supervision of Pema Kitaeff, Dive Safety Officer at the University of Washington, Friday Harbor Laboratories, to become certified as Scientific Divers through AAUS. Alongside safety and skills training, we searched for local sea spiders (Achelia chelata), and we worked to improve our underwater photography and videography skills.